Happy "Black Friday" everyone! So who braved the cold and the crowds to shop? Meeeee! It was absolutely crazy, but I loved every minute of it. Found great sales and had a good time. 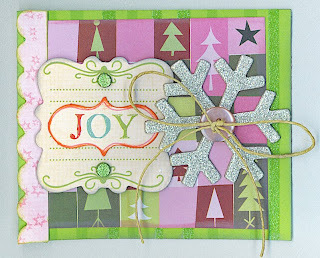 My 2 Sketches card this week is another "Joy" card. 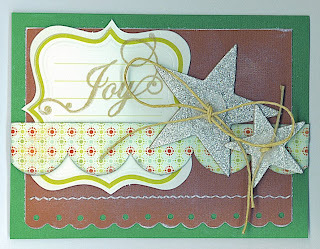 Seems like every Christmas card I make has the word JOY on it. 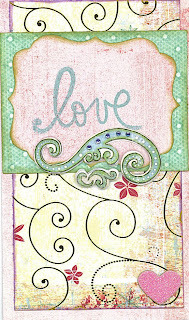 I used my Papertrey Ink stamps, SEI chipboard, My Mind's Eye Chipboard and embellishments, and Hobby Lobby paper. I really enjoyed this week's sketch, very pretty. Well I'm off to rest. I've been a Christmas present wrapping machine today, had to double wrap all of Hubby's gifts (he's a peeper). Enjoy! I've been trying to finish all of my weekly sketch challenges today since I probably won't have a lot of extra time the rest of the week. My CPS sketch this week was fun. I love the swirly gold and ivory paper I used, had been saving it (for what, who knows?) but decided it was time to break it out! I used Basic Grey, Sandy Lion, and My Mind's Eye papers, K & Co. Chipboard, Melissa Frances stickers, and an Autumn Leaves stamp with my trusty Martha Stewart Ink. Really loved the CPS layout this week, even if you don't play along you need to check out their blog, they have layouts you can use again and again. Now for a funny story. I think it's time I cleaned my desk that I scrap on! My house is clean, my scrapbook room is even clean, but the desk looks like a bomb hit it. When I buy new stuff I like to leave it out on my desk and I end up surrounded by piles and I don't even know what's what. So tonite I made a little 3x3 card, it was such a cute little birthday card and I just loved it. Well when it came time to scan the little card, it was no where to be seen! I've looked everywhere, the little card is missing. My only solution is the dogs must have liked it and kept it for themselves:) Maybe someday I will find the little card, and when I do I will show it to you. Oh and one more thing. I did go see Twilight and LOVED it! Can't believe this week is Thanksgiving! But I'm ready, can't wait to eat turkey and dressing, cake and homemade rolls. I'm planning on bringing homemade dressing (thanks to my Mother in-law) and a Smores cake to my family dinner. Thanksgiving is such a wonderful holiday, so simple...you just get to be thankful. I'm most thankful this year for my Papaw. He's had a few rough years, was a coal miner and now has bad lungs. He's been in and out of hospitals for a couple of years now and had a heart attack in January. We were worried sick, he had many complications when he was in the hospital...but I'm happy to say that was his last hospitalization of the year so far. He has to wear oxygen, but besides that he is a happy man who knows God has taken care of him. I'm so thankful he's a part of my life and I just love spending time with him and talking to him. You can learn so much from the elderly. I love hearing about when his brothers were sent to fight in World War II and his stories about the Great Depression. He is a blessing from God and knowing him makes me a better person. OK, now on to my scrapbook card of the night. It's a Christmas card that I love because it has pink in it. I just love nontraditional Christmas cards with unexpected colors. I used Provo Craft and Hobby Lobby paper, My Mind's Eye stickers and chipboard, Martha Stewart Ink, K & Co. brads, and a button with some hemp. My next project of the night was transforming a plain cookie tin into a masterpiece:) I covered it with SEI paper, used Martha Stewart ribbon and hemp, and a Creative Imaginations sticker tag. Just a few glue dots here and a little help from my Crop-a-Dile, and tada...my festive cookie tin. Hi all. I can't remember a November that's ever been this cold in Kentucky! It feels like January. So who's been to see the movie Twilight? I'm finally going tomorrow, can't wait. Hope I'm not disappointed! But I don't think any movie could ever beat the book. My card tonight is kinda different. I made it with Colorbok cardstock, Melissa Frances tag sticker, Martha Stewart ribbon, and hemp....and drum roll please....can anyone tell what the polka dots are made of? FELT! I'm telling you felt is the best stuff! The dots were so easy, just cut them out and stick a glue dot on the back and I was good to go. And they have dimension, which I love. I think the card is prettier in person, but didn't want to take the time to scan it so I just took a quick picture. OK now I have 2 pictures that have nothing to do with scrapbooking! First off, a picture of my dear ducks. They were so happy Friday morning in the snow! I just love them, I've had them almost 2 years. A friend of mine bought them for her daughter for Easter and once they started growing she didn't know what to do with them. I told her I'd be tickled pink to have them, and the rest is history. I've read that many people don't like the white ducks as pets because they are "mouthy". When they are hungry, mad, anything....they start quacking. When the girl duck gets mad she runs and lets the boy have it, quacking up a storm...kinda like we do to our husbands! 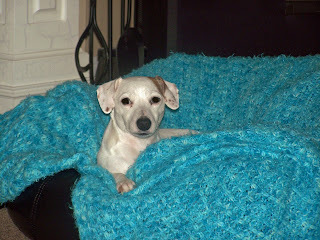 My next picture is my baby, Jake, cuddled by the fire. I adopted him from Petfinder in 2004. He was a stray with a skin condition and a collar that was about to cut into his little neck...now he is perfectly healthy with no skin condition. All it took was a little TLC. Over 100 people turned him down his foster Mommy said because of the health problems, but I'm glad because we got the best little buddy in the world! So the moral of the story is adopt your next pet, they are wonderful and thankful for all you do for them! And one last thing, if you want a chance to win some serious blog candy, go to Debbie's blog! Not only is she super talented (take a look at some of her creations) but she is also giving away a bunch of goodies! Enjoy. 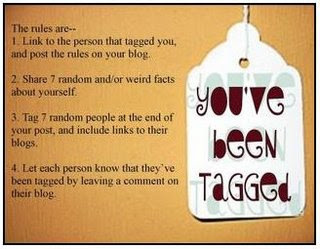 I've been tagged by my wonderful blog buddy Annette to share a little about myself. OK there's my Rule #1. 1. I'm a shrimp, only 5'1". I've never been crazy about being short. 2. I love the outdoors and nothing makes me happier than being at our barns. We have goats, mini donkeys, mini horses, chickens, and ducks. 3. I hate shoes and socks, I would wear flip flops all year if I could get away with it. 4. Didn't have a clue how to start a blog til a few months ago and I convinced myself to be a popular and published scrapbooker (my dream) I had to start one - so here I am! 5. My favorite snack is ham (sliced) and plain lays chips - it's been my snack since I was a little kid and I still can't get enough of it. 6. I'm very impatient - things must be done now. 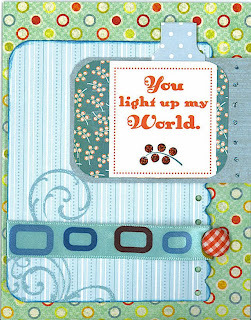 OK I think everyone in the world has been tagged by this already, so I'm tagging Mom who I love dearly and can't believe after years of begging that she's all of a sudden "Mrs. Card-Maker" and my Aunt T who inspired me to make my first scrapbook page years ago, without her I more than likely wouldn't be the scrapper I am now. I think these women are all great scrappers who try to inspire us with their blogs. (http://cardpositioningsystems.blogspot.com/). I've been going to their website forever and they have such talented designers, so I figured I'd give it a try. 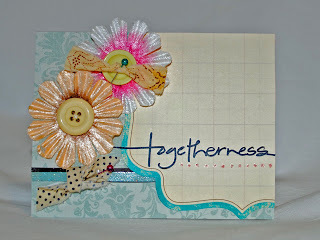 This little card came together in a snap, don't you just love when that happens?!? 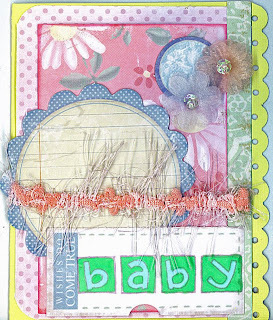 I used Reminisce paper, Creative Imaginations stickers, K & Co. brads, Martha Stewart ink, and Melissa Frances ribbon. It was so simple to put together...maybe this should be my Christmas card design? Not often that a card just comes together like that for me...I usually sit and pick at the card for hours trying to decide what it needs and changing my mind. I sometimes work as long as 3 days on a scrapbooking layout, I sit and just stare at it forever trying to figure out what it needs. I should be spending this time cleaning house! 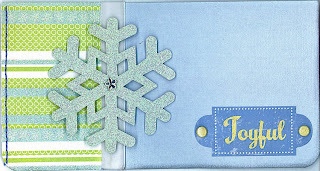 Hope tonites card puts you in the Christmas spirit. 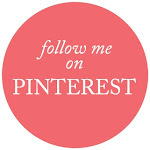 And every one needs to go to Elizabeth Kartchner's blog (link's to your right). She's having a BIG giveaway that you don't want to miss! Enjoy. OK, I don't like to talk about myself or anything....but I have to say that I am tickled pink (and purple and green and yellow) over being in the Fab 5 at 2 Sketches 4 You! It's hard to describe how it feels that people like what you make after trying so hard and loving scrapping and card making so much. OK that's all I'm saying about that, but it is an honor. 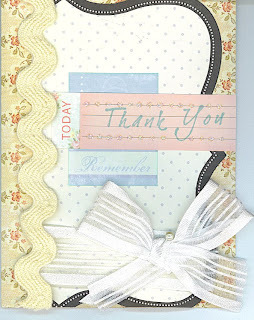 My card tonite is a "Thank You" card made with My Mind's Eye and Making Memories paper, Melissa Francis stickers and ribbon, and Martha Stewart ribbon, and a Michaels $1 stamp. The Martha ribbon I used I found in the Christmas decorations at KMart, guess it's suppose to be used for tree trimming...but they are beautiful pastels and I knew the ribbon would be wonderful sitting in my scrapbook room. 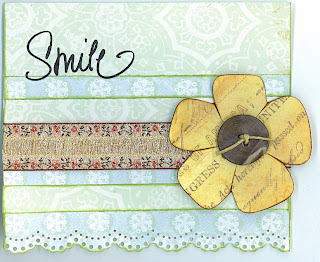 So always keep your eyes open, never know where a pretty card embellishment might be! It's very cold in Kentucky and still suppose to snow, even though they've been saying that for days and I've still not seen a drop! Anyone excited about the Twilight movie coming out this week? I'm sure me and thousands of teenagers are! Ah, what a wonderful sound. Rain! You don't appreciate it till you don't have it. We've had a terribly dry Fall and life on a farm is hard without rain. 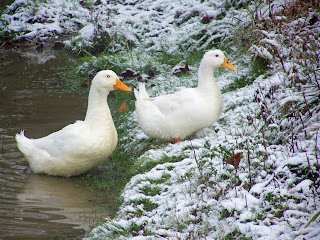 My ducks will be on Cloud 9 by tomorrow if this steady rain keeps up...but now for the bad news. This wonderful moisture is suppose to be snow by the end of the weekend. I'm already tired of the cold weather and ready for Spring. Guess what I did today? Made some Christmas cookies. I found some neat glitter gel icing for decorating the other day and couldn't resist. 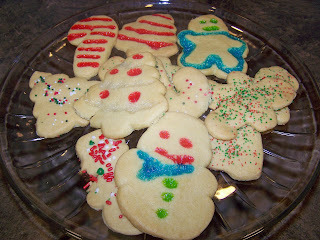 My sugar cookies turned out ok, they kinda got big in the oven, it's like the snowman went from small to large. But they were still yummy. I wasn't sure if I should use the icing before or after baking, so I used it before and love how it turned out. It sorta melted into the cookies and made them so pretty. In honor of my cooking, I've got another Christmas card tonite. 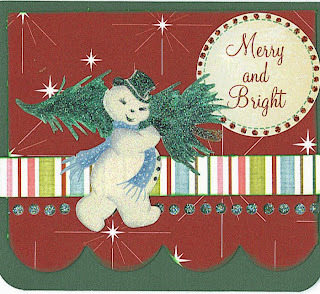 This one is so much prettier in person because the snowman is so glittery. But it was a fun card to make and someone will probably be receiving it in about a month! Well I submitted my first card to a magazine, scary huh? Guess I'll never know unless I try! Enjoy. Hi all. Tonite I finally finished my 2 Sketches 4 You challenge for the week. 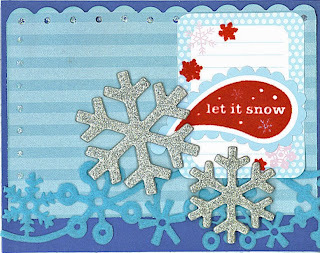 This card is in honor of the snow that's suppose to be flying by this weekend in Kentucky! 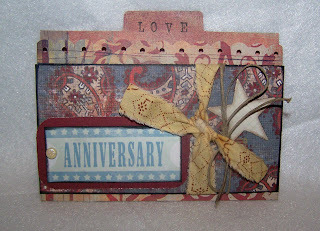 I used Reminisce paper, some Queen and Co. felt, chipboard and my Fiskars scallop punch. I don't know how I survived without that punch, use it constantly! It took me a couple of cards to finally get one worthy of submitting to 2 Sketches. So maybe you'll get to see the one's that didn't make it later this week! Enjoy! 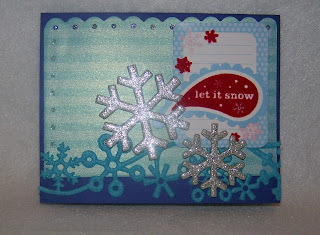 This weeks Cardalicious challenge is to make a card out of a file folder. I happen to have a little mini file folder in my scrapbook stash and had never known what to do with it. So this challenge was perfect. 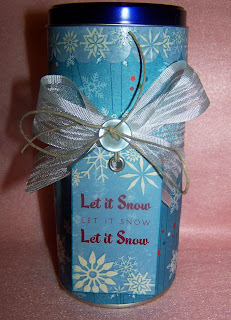 I used My Mind's Eye papers and a Melissa Francis tag with my Fiskars scalloped punch and a few random ribbons. But if you don't have a file folder it would be easy to make with a paper trimmer and a corner rounder. OK ever since my recent scrapping shopping spree I have been addicted to Melissa Francis products. 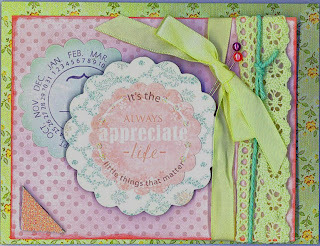 Maybe I think if I use products that Melissa Phillips loves then I'll make cards like her:) Oh well, all I know is that the products are so easy to work with. 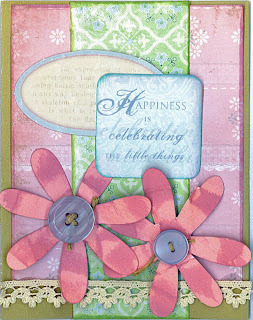 My card I'm posting tonite came together so easily and I used Melissa Francis products with a little My Minds Eye. Sometimes I will sit and just look at my products I've decided to use and never get an idea. And sometimes it only takes minutes and I think "how'd I do that". Love the times the ideas flow easily! 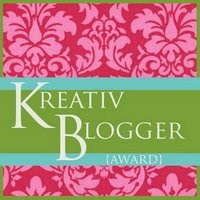 For all you 2 Sketchers fans, check out the winner this week, Lea's blog...the link is on 2 Sketches 4 You's homepage. She's one of the blogs that I have on my favorite list and I check often. She makes the prettiest cards and has great ideas. I have had such a wonderful day today. Saturday's can be so calm. My family visited today, my Mom, Aunt T, and Papaw. I just love when Papaw comes to my house, he's as funny as a monkey and you never know what he might do or say. I guess that's the good thing about being old, you can say whatever you want and don't get in trouble for it! Must be nice! My card tonite is one I really enjoyed making. It's colors that I don't use very often so I like it. Sometimes it's great to "think outside the box" and force yourself to make cards that aren't your style. How else will you learn who you are as a crafter? Goodness, that sounded like a saying in a fortune cookie! Must be time for me to get some sleep! Enjoy! I'm back....vacations shouldn't make you tired, but I end up more tired when I get back than when I left. Matt and I definitely don't relax on vacation, we live it up every second we get. But since I've got back to Kentucky it's done nothing but rain. We need the rain, but I would have enjoyed a dry day to see all my little animals at the barns that I've missed the last couple of days. My card tonite is special. It has 2 purposes. It is my 2 Sketches card of the week from Laura's sketch. And my dear friend had her baby boy on Tuesday...he's an election baby. So this card is for her. 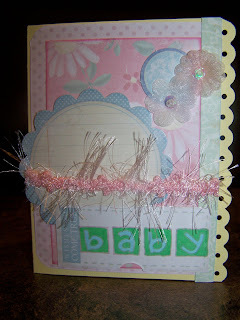 Even though she had a boy, I wanted to make it a girly card....I figure she's knee deep in blues and boy stuff. My base paper is Colorbok, but everything else is Melissa Francis. I just love her products, the colors are so soft and I'm crazy for pastels. Enjoy. Well it may be just 1 day into Novemeber, but suddenly I'm ready to Christmas shop. Amazing how you can switch focuses so fast. My hubby is soooo hard to buy for....but he is the best gift giver in the world. He always makes holidays, birthdays, and anniversaries extra special. That's just one of the many reasons I adore him. But back to my point...I've got to figure out what to get him this year. Any ideas? Tonight's card is "pink". 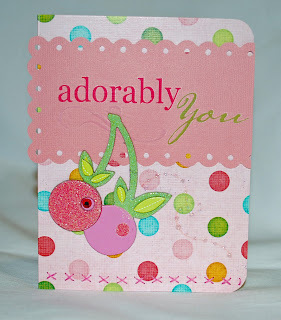 Just love the little cherry embellishments from K & Co. I have to buckle down real soon and get my Christmas cards done! Sooo I figure I'd better get all the pink in that I can now, because all I see in my future is red and green! Hope everyone remembered to set their clocks back. I'm already looking forward to springing forward - my glass must be half full instead of half empty! Hey scrappers! I've had a bug...a stomach bug. I slept straight through halloween. You don't need to know the details other than the fact that I survived a rough 24 hours! I think my hubby has me in quarantine. So I finally dragged myself off my sick bed to do my 2 Sketches challenge this week. My first card was really fun. Seems like I just kept adding stuff to it. Really enjoyed the layout. My bonus card was really fun also.When I first looked at the drawing I didn't have a clue what to do with it. Then I inverted it a little and made a Christmas ornament out of it. 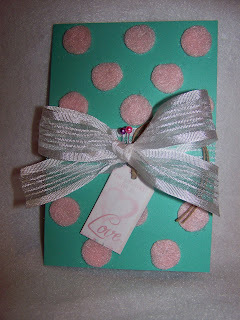 I glittered pop-up dots to make the neat 3D polka dot effect. And I used my ornament hanger as a hidden sentiment note. That away my card doesn't open, the sentiment is tucked away. Enjoy!